26 July 2006: Poverty, family disintegration, violence at home, lack of opportunity, poor education, social inequality and drugs. Those are the ingredients of an explosive cocktail making Latin American cities some of the most violent areas of the world. In the extreme north of Latin America, the Maras (the Central American term for gang) is the rising form of organised violence that is the scourge of El Salvador, Honduras, Guatemala and southern Mexico - expanding more and more to that country’s centre - and into Colombia, Brazil and other South American countries. The Maras is a street gang formed by excluded young people. It originated in Los Angeles, California, in the 1960s. The Mara 18 (in those days the gang from 18th street) was quite powerful in its quarter and when the Mara Salvatrucha (Mara 13) attempted to enter that quarter, a gang war started that has been going on ever since. Those gangs were mostly made up of Latin migrants from Mexico and El Salvador, the latter fleeing from their country’s civil war. In the early 1980s the gangs spread to other US cities incorporating other groups of migrants from Honduras, Peru, Ecuador, Guatemala and Nicaragua. It spread throughout Latin America after many of its members were convicted in the US and jailed and then later deported. Maras members exceed 100,000 in Central America - counting only those who have gone through the initiation ritual. Members are identified by tattoos on their bodies that state the gang they belong to, and which shows an important event in the person’s life within the gang, his latest killing for instance, and the hand signals they use to communicate with other members. Solidarity is the highest value among them. A Mara member may quit the gang for an acceptable reason but if there is no valid reason he or she may be murdered. For children living under extreme social deprivation the Maras represents the only possibility of achieving recognition. Youngsters compete for the opportunity of undergoing the initiation ritual, which can vary from selling drugs, bearing a violent beating from other members, to even killing a police officer. Among the Maras there are drug dealers, hired assassins, thieves, racketeers, rapists - in other words, killing machines that care nothing for the consequences. Their main reason for existence is to fight other gangs over the control of territory. 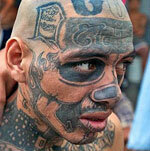 In El Salvador the Mara Salvatrucha (or MS-13) has more than 50 thousand members. They engage in robbery, abduction, torture - even decapitation of their victims to show their power. In Mexico the Maras use the frontier with Guatemala to rob migrants from South and Central America trying to reach the US. In Honduras, the Maras have killed innocent men, women and children in revenge for police operations. In Mexico and Central America the perceived Maras invasion is creating horror and fear among people, and suppressive measures are being multiplied. However, the Maras are not guilty of all of the crimes they are blamed for. Tony Saca, the President of El Salvador, called his programme “Super Tough Hand”. Under the plan, police arrested almost 5,000 young people suspected of being members of gangs just because they wore a tattoo. El Salvador has changed its penal code so that the police may arrest minors. A boy may be 15, but if he is an assassin the “Super Tough Hand” programme is applied and he is imprisoned. The governments of Guatemala and Honduras have declared similar suppressive measures against the Maras called “Broom Plan” and “Bleu Freedom Operation”. Mexico also has its department of justice in pursuit of the gangs. However, all of those countries ignore the possibility of prevention, instead focusing on force. They ignore the social causes. New policies are needed that return to the youth of the region its fundamental rights. That means education so that communities are not abandoned. The whole social environment of the young must be modified so that they are provided with skills and opportunities so that in time the young are able to contribute to their communities and feel a part of them. But no, the governments of Central America are getting ready to begin a war against the gangs in the name of national security. The spreading of the Tough Hand model throughout the region will force the gangs to expand into Nicaragua, Costa Rica and Colombia. If the region’s governments continue ignoring the social conditions that cause this problem, it will get worse. Suppression, in response to a public tired of crime, does not get to the root of the problem. For Saca and more and more Latin Americans, however, the Tough Hand seems to be the solution of the future. It is cheaper and less complicated for them, I think. There lives in my city an 82-year-old lady who loves animals. Her name is Maria. She has two canaries, about 10 cats and a dog. As a girl, she recalls, she would make plastic shoes for the cats, enjoying herself as she watched them walking around and shaking their paws. First thing in the morning she cleans the birdcage while singing to them. Then she replenishes their food containers. All the while she praises them for their beauty, and in return they answer by singing for her as well. She chose those two birds because they have a funny ruffled crest.